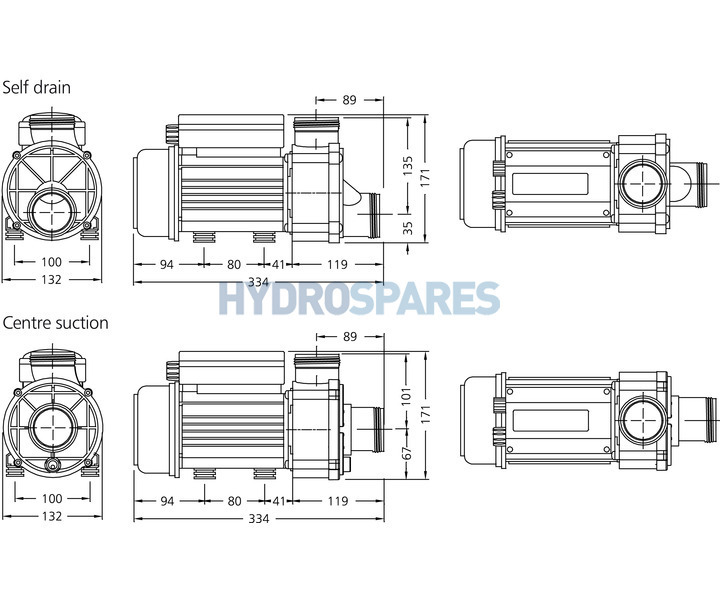 HydroAir HA350 - Whirlpool Bath Pump 21-35221 0.68kW - Centre Suction - Pneumatic. The HydroAir HA350 pump range is our most popular selling bath pump. Their versatility makes them a popular choice if you are replacing a whirlpool bath pump that you cannot get a like for like model. The HA350 range will also replace many older HydroAir pumps. They are also a great unit to replace some Chinese filtration/whirlpool pumps. Silent running motors coupled with either self drain or centre suction wet ends make for energy efficient compact pumps. All models are fitted with a pneumatic (air) switch so on/off operation is possible either with air buttons or electronic controls. For detailed measurements and specification see documents in the downloads tab. Unions sold separately. I'm very satisfied with the swift deliverance of the product. It took just a few days to arrive from the UK to Sweden where I live. The product was well packed. I also assume that the product is of good quality (the old pump still works but has some leakage - I bought it that way from the former owner of the house), and is offered for a very reasonable price, compared to our domestic offers. Enclosed I also found the extension guarantee document for the product.